It is said that Morning shows the day and is perfectly true for Freshersworld.com, as its Journey of exclusive campus recruitment drive for 2015 has already started with a grand success. Now its pace has doubled which can be felt by its Exclusive Drive Journey for the financial ending month “March 2015”. For this month Fresherswold has conducted numerous exclusive campus recruitment Drive, Which includes elite clients like Huawei Technologies, EMC Corporation, Aptean, Shoretel, Motorola, Practo Technologies, HT media, MAQ Software, Attra Infotech etc. across India. Talking about one of the Major drive among all, is with our client Attra Infotech, The drive was conducted on 19th March 2015 at Cambridge Institute of Technology, Bangalore. 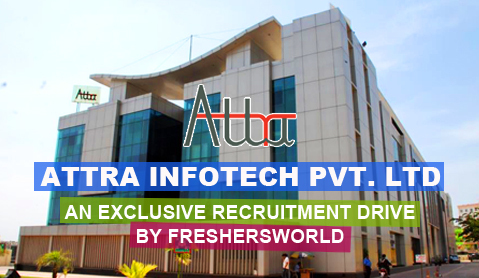 Attra Infotech was hiring for the position of Associate Engineer and looking for BE/B.Tech(Computer Science & Engineering (CSE), Electronics & Communication Engineering(ECE), Information Science/Technology (IS/IT)), MCA candidates from 2014 Batch. They were offering a full time Job with a package of INR 2.84 LPA. The whole Hiring Process consisted of 3 stages namely online test, Group Discussion and Face to Face Interview. Attra Infotech is a MNC which is mainly known for its IT solutions and services. Its core focus lies on banking, finance and payments industry. It provides a wide range of IT services including Consultancy, Application Management, Independent Testing, Portfolio Migration, Production Support, System transformation, Integration, Automation services and Business Intelligence. Attra Infotech success is due to its capability of addressing the needs of clients with solution in a flexible, cost-effective, quick to deploy and reliable manner. For the position of Associate Engineer they were mainly looking for the candidates with Good analytical, logical, communication and programming skills and also stressed on the aptitude in C/ C++/ .NET/ JAVA etc. The Freshersworld exclusive drive witnessed a crowd of 500+ candidates and it’s all due to the dedicated effort of Freshersworld team. 125 students cleared the online test screening & GD and were called for the Final Interview. The whole process from the day of filtering the eligible candidates to final interview took hardly 2 weeks. The count of Final job offered and joined is yet to come but the thrill is at its peak among the freshers as in the new financial year, market is going to be flooded with exclusive drives from Freshersworld.